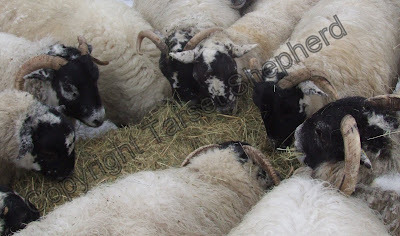 Shepherd's blog: Why don't all sheep eat hay? "When the hay/ straw or whatever it is gets put out for the sheep why don't some of them eat it?" is a question I was asked recently. Kinda threw me for a moment or two I have to say but I would utter some sort of knowledgeable reply no doubt. 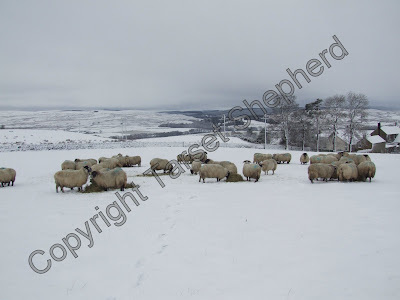 Sheep will be being fed on silage or hay. Straw can and does get used for feeding but generally is used for bedding, it would be fairly safe to say that whatever type of bale is being fed to sheep in Tarset it will be either silage or hay. The big round bales may be silage or hay, the small oblong bales which are easily carried by man will be hay. So why don't all the sheep eat the hay or silage? When I sit back and contemplate the query there are actually a number of answers some of which depend on how the stuff was presented for them. All fodder is supplementary feeding, a substitute for the real thing. Given to the stock when their own choice of food is in short supply or of poor nutritional value. 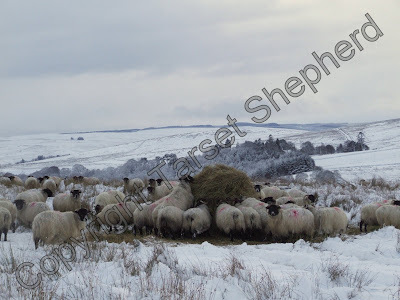 At the moment, with snow cover, bales are being put out for the sheep to help them keep their bellies full. On the rough hill ground it is still possible for the sheep to scratch through the snow and find green shoots lying below it, to many this might be sweeter to the palate than what the shepherd is offering. If the bales are put into feeders - that being round metal feeders for the round bales and metal hay hecks with lids for the small bales - there is a limit to how many bodies can get around these feeders at one go so it may appear that some aren't eating the fodder, whereas it is most probable they've either had their fill and left or can't shoulder their way in to have a guzzle. The large round bales can be rolled out on the ground, either mechanically or physically, there by allowing all the sheep to gain access to the food. There will be a long line of hay with sheep standing, walking on it and eating it. Small bales are easily scattered out on the ground and generally done so in a large circle with a decent space between each slice of the bale. The idea being that the sheep will stand around each slice of hay eating it and excreting away from the fodder, if they wish to move on to a different slice they can do so without walking over the fodder on the ground, they have to travel across open ground to reach the next slice, hopefully that way there will be less waste. Many explanations as to why it would appear some sheep aren't eating the fodder on offer, just like humans some are greedy and will gorge themselves, others are shy and get knocked out, there are those who have found something sweeter and are quite content with their lot and there is always the minority who just wont - I wouldn't thank you for 'foreign' food, sheep can be equally as choosy. What is the difference between hay, straw and silage? Are they different plant species, different plant parts (e.g. stems or leaves) or processed differently (e.g. dried in the air)? Silage - wilted grass (baled green(damp), wrapped then fermented). Haylage - 'damp' hay which when baled, wrapped and fermented comes out as very dry silage. Straw - stalks off the corn, dried and baled. Silage is generally darker in colour than hay and heavier in weight. Straw is generally a yellow colour. I will try and write a blog accompanied by photos to explain this some time. Thank you for explaining the difference between hay, silage, haylage (new to me) and straw.